First Saturday Amador Art Trek for April 5 will spotlight a new set of artists whose works will be featured at receptions in most galleries. Remember, you can take the Art Trek anytime. A map of Art Trek galleries can be viewed at www.amadorarts.org. Notable for your free gallery-hopping fun on April 5th is that many new artists, some never featured here before, will be in the galleries this month, such as Jim Glanton, Janet Piccola, Joseph Bellacera, James Aarons, Alex and Mona Szabados, and Janice Freischlag . The monthly 1st Saturday Art Treks are scheduled from 1:00 – 6:00 pm. Usually the receptions are from 3-6 pm, but some last ‘til 7 pm or later. Going on the Trek is FREE, a time to have fun seeing what ten galleries are currently exhibiting. There might be an artist's reception, cookies and punch, wine and cheese, music, or simply staying open a little longer. AmadorArts Gallery - Jim Glanton and Janet Piccola – After 50 years as an architectural illustrator Glanton now creates and successfully sells his realistic watercolors and abstract acrylics. Janet Piccola, after retiring from CalFire is now a ceramic artist who loves the tactile qualities of creating in clay and the surprises achieved from using the wheel, and experimenting with glazing and firing. Both artists will be hosted at a reception in their honor onSaturday, April 5, from 3 to 6 p.m. coinciding with the First Saturday Art Trek. Operated by the non-profit AmadorArts, the gallery is at 11-A Randolph St., Sutter Creek, and is open weekends 1:00 to 4:00 pm and weekdays,9:00 am – 2:00 pm, except Wednesdays. Little City Studio & Gallery - A Kaleidoscope of Local Art: Newly quilted works by Sandy Wagner including "About to Bloom" and "Water Falling", plus jackets featuring an impeccable technique using her hand-dyed textiles along with commercial fabrics. Cathleen Berglund has new work, "Mat's Shoes, Locke, Ca" which she claims as her all-time favorite! Four other paintings reflect her personal and very recognizable 'architectural' style. New pottery from Marilyn Baldwin spotlights a crystallizing glaze which adds luminosity to the surface of her slabwork pieces. Bruce Peccianti has brought in more of his intriguing "zen doodles" drawings, highly-likable pen and ink works of tea pots or natural subjects, and a larger collage piece as well. Gallery hours are Friday, Saturday, and Sunday from 10-5. On Art Trek Saturdays, the gallery stays open a bit later for your convenience. 14180 Main St., Amador City, CA 95601. Call 209-267-9189 for info. Gallery 10 - Foothill Reflections: New Paintings by Julie Trail – She has been discovering the way the California foothills are reflected in various bodies of water: streams, rivers, creeks, ponds, and fresh rainwater puddles. In both watercolor and oil paintings, Julie's newest collection explores the way water draws us into a place, giving us a clean, new, fresh view of the landscape. A champagne reception, catered by Susan's Place, will take place at Gallery 10, 15 Eureka Street, Sutter Creek, on Saturday, April 5, 2-4 pm. The Gallery is open Thursdays through Mondays between 11 and 5. For further information contact 209-267-0203 or visitwww.gallery10suttercreek.com. Sutter Creek Gallery - Janice Freischlag is the featured artist for April, who says, “My passion is to bring life to my art with color, style and textures that stimulate all the senses.” She began her fascination with art in 1989 while living in Wiesbaden, Germany, when she learned Bauernmalerei, a German folk art. Upon returning to the U.S., she expanded her skills and took up oil painting and was soon getting commissions for pet portraits and more. She is now accomplished in a wide range of painting media in which she creates images of florals, animals, and seascapes at her Lake Comanche home. A reception in her honor will be held on Saturday, April 5, from 4 to 7 p.m. Spend some time with Jan Freischlag at her reception which is part of the First Saturday Art Trek. She is one of 30 local artists exhibiting at the cooperative located in the heart of Sutter Creek at 35 Main Street. Sutter Creek Gallery is open Sunday, Monday, Wednesday and Thursday from 10 a.m. to 5 p.m., Friday and Saturday 10 a.m. to 6 p.m. For additional information, call 209-267-0228 or email suttercreekgallery@gmail.com. Fine Eye Gallery – Small Infinities - Mixed Media Paintings by Joseph Bellacera and Ceramic Paintings by James Aarons. April 1 – May 15, 2014; Art Trek, Saturday, April 5, 1-6pm. New work by Sacramento painter Joseph Bellacera combines the trickery of physical trompe l’oeil with deeply mysterious gestures of animated anemones, big blushes of supernovas and the sublime quiet of cells dividing. The Fine Eye’s own James Aarons will present panels, each of which is a muscular sheet of super smooth, ultra flat clay awash with white space where there is plenty of room for the eye to move about. These are reflections of the urban landscape, its structures, its shadows and its mystery. Both artists have looked to our environment to observe the quality and function of light. 71 Main St., Sutter Creek, CA 95685. Gallery Hours: 11:00am – 5:30pm daily. www.fineeye.com or call209-267-0571. Petroglyphe Gallery -Designing Powerful Landscapes – A Workshop with Dale Laitinen - will be April 4-6th, 9 am – 4 pm. Current featured artists are Mona and Alex Szabados, who are known for their exquisite, finely detailed art jewelry in enamels, now have on exhibit a larger 3-dimensional stand-alone sculptural work. Regular hours: Thurs – Sat 11:30am – 5:30pm, Sunday 11:30am – 4:00pm. 8317 Main St., Mokelumne Hill, CA 95245.www.gallerypetroglyphe.com or call 209-286-1387. Add Art Provides fine art framing services and displays the work of John Johannsen who first showcased his vibrant whimsical canvases in a one-man show at the California Palace of the Legion of Honor. 20 Main St., Jackson, CA 95642. www.addart.com 209-223-3339. Valley View Interiors - A design resource located in historic Sutter Creek. Current artists on display are Tricia Rissmann, contemporary abstracts and Kathryn Venturelli, mixed media and copper plate prints. VVI specializes in residential and hospitality interiors, with 25 years of design experience. 48 Main St., Sutter Creek, CA 95685. Freischlag began her fascination with art in 1989 while living in Wiesbaden, Germany. She started with Bauernmalerei, a German folk art used to decorate furniture, plaques, clocks and other household items. After five years in Germany, she returned to the U.S. and worked to broaden her painting skills. She and her husband moved to Lake Tahoe where she was fortunate to befriend Lola, her mentor and owner of Lakeside Gallery. At that time, Freischlag took up oil painting and was soon getting commissions for pet portraits and more. She is now accomplished in a wide range of painting media in which she creates images of florals, animals, and seascapes at her Lake Commanche home. Sutter Creek Gallery invites you to spend some time with the artist at her reception which is part of the region’s First Saturday Art Trek. She is one of 30 local artists exhibiting at the cooperative located in the heart of Sutter Creek at 35 Main Street. The gallery is open Sunday,Monday, Wednesday and Thursday from 10 a.m. to 5 p.m., Friday and Saturday 10 a.m. to 6 p.m. For additional information, call 209-267-0228 or email suttercreekgallery@gmail.com. Web site: suttercreekgallery@gmail.com. Their exhibits open Saturday, April 5, during the 1st Saturday Art Trek event, and continue until April 29. Both artists Glanton and Piccola will be hosted at a reception in their honor on Saturday, April 5, from 3 to 6 p.m. Operated by the non-profit AmadorArts, the gallery is at 11-A Randolph St., Sutter Creek, and is open weekends 1:00 to 4:00 pmand weekdays after March 16, 9:00 am – 2:00 pm, except Wednesdays. AmadorArts members receive 10% off their purchases in the AmadorArts Gallery. For more info, phone 209-267-9038 or visit www.amadorarts.org In May, the featured artist will be Bruce Peccianti. AmadorArts Gallery - Jim Glanton and Janet Piccola – After 50 years as an architectural illustrator Glanton now creates and successfully sells his realistic watercolors and abstract acrylics. Janet Piccola, after retiring from CalFire is now a ceramic artist who loves the tactile qualities of creating in clay and the surprises achieved from using the wheel, and experimenting with glazing and firing. Both artists will be hosted at a reception in their honor onSaturday, April 5, from 3 to 6 p.m. coinciding with the First Saturday Art Trek. Operated by the non-profit AmadorArts, the gallery is at 11-A Randolph St., Sutter Creek, and is open weekends 1:00 to 4:00 pm and weekdays, 9:00 am – 2:00 pm, except Wednesdays. Little City Studio & Gallery - A Kaleidoscope of Local Art: Newly quilted works by Sandy Wagner including "About to Bloom" and "Water Falling", plus jackets featuring an impeccable technique using her hand-dyed textiles along with commercial fabrics. Cathleen Berglund has new work, "Mat's Shoes, Locke, Ca" which she claims as her all-time favorite! Four other paintings reflect her personal and very recognizable 'architectural' style. New pottery from Marilyn Baldwin spotlights a crystallizing glaze which adds luminosity to the surface of her slabwork pieces. Bruce Peccianti has brought in more of his intriguing "zen doodles" drawings, highly-likable pen and ink works of tea pots or natural subjects, and a larger collage piece as well. Gallery hours areFriday, Saturday, and Sunday from 10-5. On Art Trek Saturdays, the gallery stays open a bit later for your convenience. 14180 Main St., Amador City, CA 95601. Call 209-267-9189 for info. She has been discovering the way the California foothills are reflected in various bodies of water: streams, rivers, creeks, ponds, and fresh rainwater puddles. In both watercolor and oil paintings, Julie's newest collection explores the way water draws us into a place, giving us a clean, new, fresh view of the landscape. A champagne reception, catered by Susan's Place, will take place at Gallery 10, 15 Eureka Street, Sutter Creek, on Saturday, April 5, 2-4 pm. The Gallery is open Thursdays through Mondays between 11 and 5. For further information contact 209-267-0203 or visitwww.gallery10suttercreek.com. She began her fascination with art in 1989 while living in Wiesbaden, Germany, when she learned Bauernmalerei, a German folk art. Upon returning to the U.S., she expanded her skills and took up oil painting and was soon getting commissions for pet portraits and more. She is now accomplished in a wide range of painting media in which she creates images of florals, animals, and seascapes at her Lake Comanche home. A reception in her honor will be held on Saturday, April 5, from 4 to 7 p.m. Spend some time with Jan Freischlag at her reception which is part of the First Saturday Art Trek. She is one of 30 local artists exhibiting at the cooperative located in the heart of Sutter Creek at 35 Main Street. Sutter Creek Gallery is open Sunday,Monday, Wednesday and Thursday from 10 a.m. to 5 p.m., Friday andSaturday 10 a.m. to 6 p.m. For additional information, call 209-267-0228 or email suttercreekgallery@gmail.com. Harry Nakamoto's works are fired using processes adapted from historic and prehistoric times. One process, Raku, first used in sixteenth century Japan to fire tea ceremony vessels, involves extreme and very rapid temperature changes that would shatter ordinary pottery. Another process, the Anagama... "cave kiln" in Japanese, is an ancient design that was abandoned about three hundred years ago and revived in the early part of the last century. The firing process involves stoking firewood in to the kiln for seventeen hours each of the five consecutive days required to complete the cycle. Designing Powerful Landscapes – A Workshop with Dale Laitinen - will be April 4-6th, 9 am – 4 pm. Current featured artists are Mona and Alex Szabados, who are known for their exquisite, finely detailed art jewelry in enamels, now have on exhibit a larger 3-dimensional stand-alone sculptural work. Regular hours: Thurs – Sat 11:30am – 5:30pm, Sunday 11:30am – 4:00pm. 8317 Main St., Mokelumne Hill, CA 95245.www.gallerypetroglyphe.com or call 209-286-1387. SPRING FLOWERS with artist Tracy Lewis is a one day watercolor workshop, in which participants will learn to paint vibrant and luminous flowers in watercolor using wet into wet and glazing techniques. 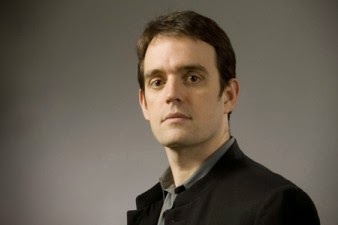 The focus will be on keeping colors pure and fresh using a limited palette. Participants may follow along step by step, or work from their own image. Tracy Lewis teaches workshops throughout Northern California and the Western United States. She works primarily in transparent watercolor and is a purest in her approach to the medium. Layering luminous transparent glazes of pure hue gives her work a candy coat of Easter-like color. Her work is featured throughout fine art galleries in the region. Please visit www.gallerypetroglyphe.com/event/workshops for more info and to download the registration form or call 209-286-1387. Cost is $85 and registration is limited. Petroglyphe Gallery is located at 8317 Main Street, Mokelumne Hill, California, two blocks off of Highway 49, across the street from the historic Hotel Legér. The gallery is open Thursdays through Saturdays 11:30 am - 5:30 pm and Sundays 11:30 am - 4:00 pm. The 58th Juried Exhibition at The Haggin Museum sponsored by Stockton Art League. August 7 – September 28, 2014. Cash awards over $5000. Open to all US artists. No photography or computer art. Smarter Entry deadline June 12, 2014. Website: https://client.smarterentry.com/sal. California State University Chico is seeking applicants for a commissioned exterior artwork for the new Arts & Humanities building, currently under construction. The project budget is $70,000 and is open to professional artists working in the United States. Please view the complete RFQ athttp://www.csuchico.edu/purc/vendor/RFQ2014-01SR.shtml. Nicole Bommarito, the new Art Teacher at Amador High School is working on mural mosaics for the park in Pioneer. She is looking for mosaic materials, specifically stained glass pieces. If you have any materials to donate to this project, please get in touch with Terra at AmadorArts and I will connect you! Thanks! The Mother Lode Friends of Music, the regional organization of classical music performances, presents a program of contemporary chamber music on Sunday, April 6, starting at 2 pm at the Church of the Nazarene, 14050 Ridge Road, in Sutter Creek. The instrumentalists are all regular players on the Friends of Music roster; flutist Janet Telford of Soulbysville, oboeist Jane Buzzard and bassoonist Gail Buzzard of Sonora, clarinetist Hank King of Pioneer, and hornist Bill Minkel of Camp Connell. Performing the Zimmerli trio are concert violinist Corina Stoian of Hayward, cellist Erik Urbina of Stockton, and pianist Ron Brickman of West Point. Urbina was recently acclaimed as the cello soloist in a performance of Haydn’s second cello concerto with the Friends of Music Orchestra. Sutter Creek Gallery invites you to spend some time with the artist at her reception which is part of the region’s First Saturday Art Trek. She is one of 30 local artists exhibiting at the cooperative located in the heart of Sutter Creek at 35 Main Street. The gallery is open Sunday, Monday, Wednesday and Thursday from 10 a.m. to 5 p.m., Friday and Saturday 10 a.m. to 6 p.m. For additional information, call 209-267-0228 or email suttercreekgallery@gmail.com. Jackson, CA (March 2, 2014) – As their Spring Fundraiser, and honoring “short attention spans” everywhere, Main Street Theatre Works is hosting a Weekend of One-Acts. This is their Spring Fundraiser, that sets the stage for their upcoming Summer Season at the Kennedy Mine Amphitheatre. 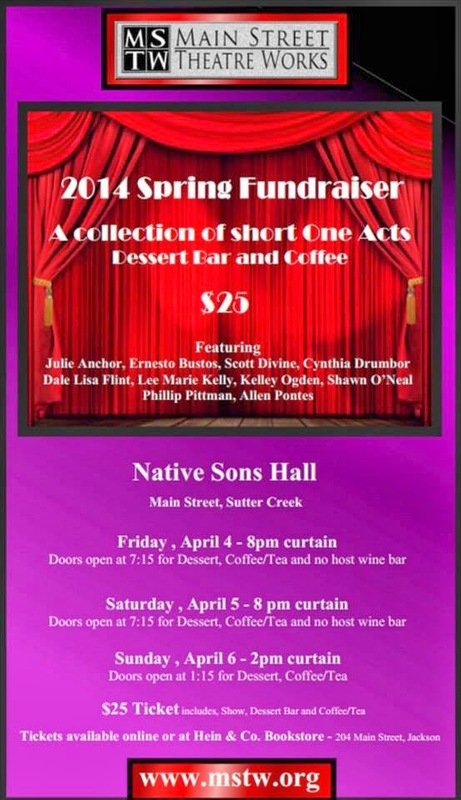 On April 4th, 5th & 6th, come see some of your favorite actors live on stage at the Native Sons Hall in Sutter Creek. There are two evening performances ~ Friday and Saturday, April 4th & 5th, with doors open at 7:15pm for dessert, show starts at 8pm. There will also be a matinee performance on Sunday, April 6th, with. doors open at 1:15 for dessert, show starts at 2:00pm. Tickets are $25 each and include a dessert, your choice of coffee or tea, and the show. There will also be a no-host bar with beer and wine on Friday and Saturday nights. MSTW is excited about kicking off our 11th season at the beautiful Kennedy Mine Amphitheatre, in the heart of Jackson. This summer’s season includes Moliere’s comedy Tartuffe and The Golden State, inspired by Moliere’s “The Miser”. To prepare everyone for a summer of laughs, we are presenting a Weekend of One-Acts packed with laughs and with some of your favorite actors from MSTW’s past seasons ~ Julie Anchor, Ernesto Bustos, Scott Divine, Cynthia Drumbor, Dale Lisa Flint, Lee Marie Kelly, Kelley Ogden, Shawn O’Neal, Phillip Pittman, and Allen Pontes. It’s an all-star cast performing in a variety of short One-Act plays. Price of admission includes, not only the show, but some fabulous desserts, tea/coffee, and the joy of knowing you’re supporting one of the areas best professional-quality theatre companies. For more information and to purchase tickets to this Limited Engagement Event, visit the MSTW website at www.mstw.org. Tickets for Saturday night’s show are very limited, and the other two performances are guaranteed to sell out, as they did last year, so get your tickets today! For more information, please visit our website at www.mstw.org. Barbera Festival tickets begin selling tomorrow. See below for details. This is a reminder that ticket sales for the fourth annual Barbera Festival begin tomorrow, Saturday, March 1. We expect a quick sell out (last year sold out in just a few days) so don't wait to get yours. Please also be sure that others in your group get their tickets early. For more information and to buy your tickets online see our web site, or go directly to theticketing site. Tickets can also be purchased in person at Amador360 in Plymouth, located at 18590 State Highway 49, Plymouth, Ca, a quarter mile south of Shenandoah Road (open 11am-6pm daily). Also at Amador360, while supplies last, we are selling past year Barbera Festival glasses and tee shirts, fleeces, and caps, at 25% off retail prices. All proceeds benefit the Amador Community Foundation. Copyright © 2014 The Barbera Festival, All rights reserved.